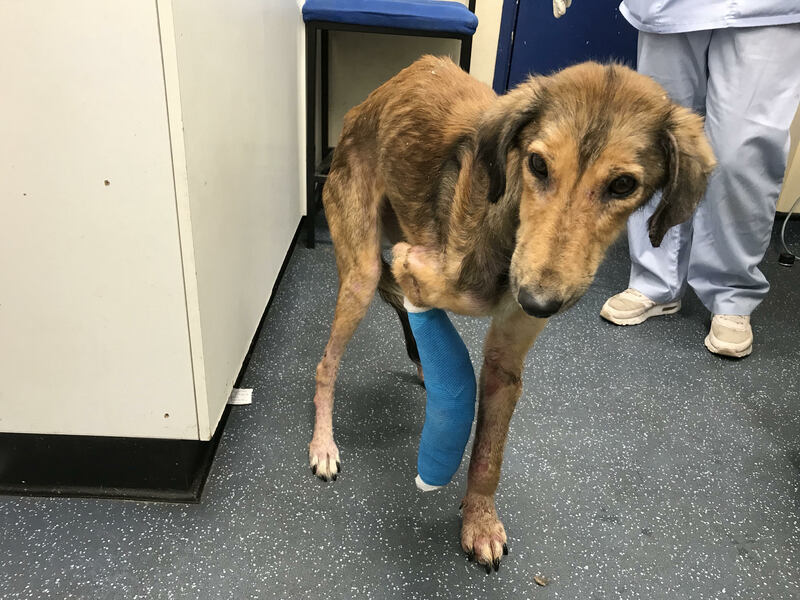 The RSPCA is appealing for information after a very poorly Saluki-type dog limped onto a petrol station forecourt in Huddersfield. CCTV footage shows the female, brindle-coloured dog in a terrible state limping into the forecourt of a BP Garage on Wakefield Road, Lepton, at around 8.10am on Thursday 20 September. A member of the public called the RSPCA and took her to a nearby vets. The dog – now named Susie – was found emaciated, covered in sores and with a broken leg. She also had black football socks covering her skin condition and tied so tightly round her legs that vets had to cut into them. 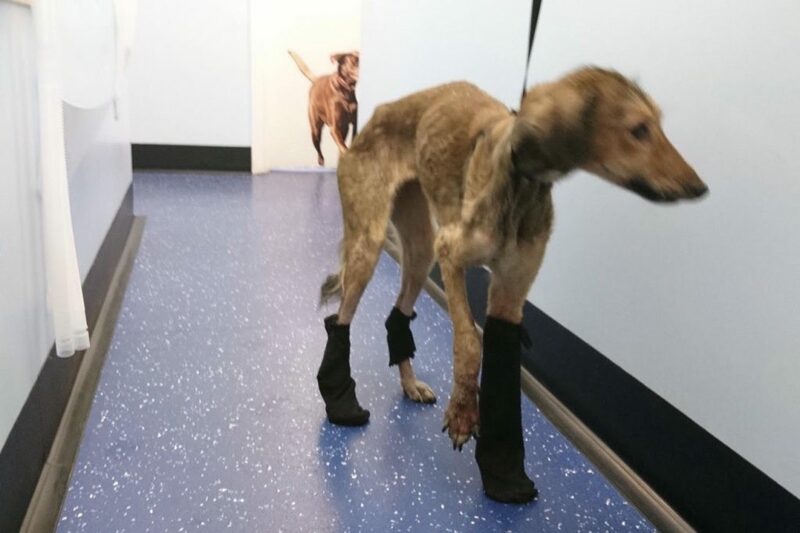 RSPCA inspector Rebecca Goulding said, “We believe her leg had been broken for about a week before she was found, and the socks had been on longer because the broken leg also had a wound where a sock had been. 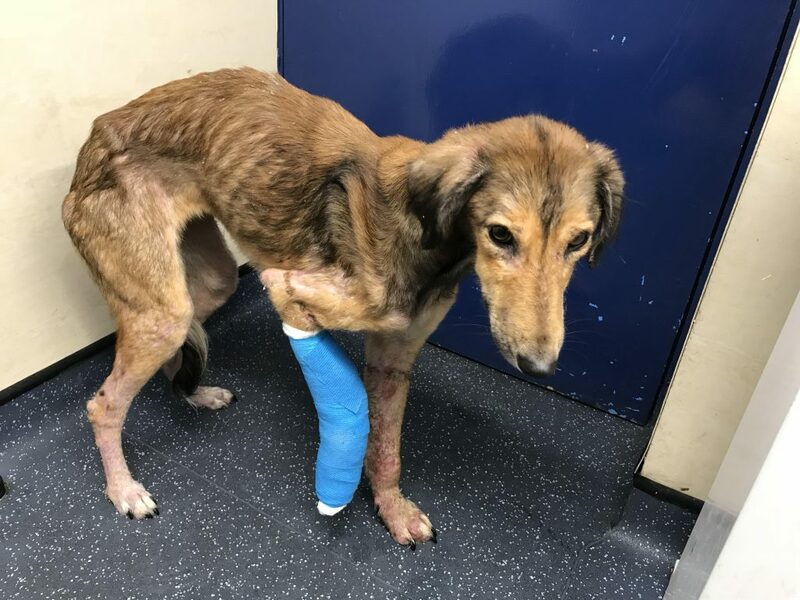 The RSPCA are appealing for anyone who recognises her, knows who her owner is, or has any specific information that might help the investigation, to call the RSPCA appeal line on 0300 123 8018 and leave a message for Inspector Goulding. Inspector Goulding explains, “She really is the sweetest thing, and hasn’t misbehaved once when she has been getting treatment. “She was transferred to the RSPCA’s Greater Manchester Animal Hospital in Salford where everyone fell in love with her and has now been moved to an RSPCA branch where she has started to put on some weight. “Her skin conditions, which are contagious, means she is having to be kept in isolation and is receiving daily treatment, and it looks as though her broken leg will need to be amputated as it had started to heal in the wrong position. She wasn’t microchipped – as is required by law – so at the moment there is no way of tracing her owner.